As is men, the genes that cause hair loss can be inherited from either your mother or father. The expression of these genes is dependent on hormones called androgens, so common hair loss in women is called “Androgenetic Alopecia” (the same term is used for common balding in men). There are a number of reasons to explain why hair loss in women presents differently than in men (although all of the factors are still not completely understood). Probably the most important reason is that men have a much higher level of the androgen testosterone. This is the hormone that is responsible for male sexual characteristics and, when the body converts it to DHT, it becomes the main culprit in causing baldness. Fortunately, the much lower levels of testosterone in women spare them from the extensive hair loss that is often seen in men. 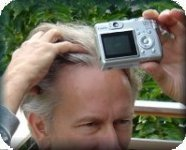 Testosterone is converted to DHT by the enzyme 5-alpha reductase that is present in higher concentrations in the balding areas of the scalp. Women have only ½ the amount of this enzyme overall as men and have even less in the crown. In addition, women have higher levels of an enzyme called aromatase in all areas of the scalp that may block the formation of DHT. This enzyme is present in especially high concentration in the frontal hairline in women, possibly explaining why this area is fortunately resistant to balding in most females. With age some normal degree of hair loss occurs in everyone so that total hair volume will decrease over time in both sexes. The hair loss associated with genetic balding is also dependent upon time to express itself. Hair loss tends to occur at different rates at different periods in one’s life with increased loss often occurring during periods of hormonal change, such as pregnancy and menopause. A number of “non-androgenetic” factors may be responsible for hair loss in women. Women’s hair seems to be particularly sensitive to underlying medical conditions. Since “systemic” problems often cause a diffuse type of hair loss pattern that can be confused with genetic balding, it is important that women with undiagnosed hair loss, especially of the diffuse or “un-patterned” type, be properly evaluated. The decision of when to perform a laboratory evaluation in women experiencing hair loss must be made on an individual basis by your physician. In this section we briefly describe some of the situations where your doctor may order lab tests and what they might be. It is important to stress that this is just an overview for your general information. When a physician orders laboratory tests he/she bases it upon specific clinical information and this can only be determined by the doctor who evaluates you. Severe woman’s hair loss before & after photos – using the AFR™ program. This entry was posted in Hair Loss in Women on February 25, 2010 by Larry Shapiro.